When cells of the lung start growing rapidly in an uncontrolled manner, the condition is called lung cancer. Cancer can affect any part of the lung, and it's the leading cause of cancer deaths in both women and men in the United States, Canada, and China. There are two main types of lung cancer. Small-cell lung cancer (SCLC), sometimes called small-cell carcinoma, causes about 10%-15% of all lung cancer. Non-small-cell lung cancer (NSCLC) causes the rest. Both include many types of cells that grow and spread in different ways. They are named according to what the cells look like under a microscope. Small-cell lung cancer responds well to chemotherapy (using medications to kill cancer cells) and radiation therapy (using high-dose X-rays or other high-energy rays to kill cancer cells). The predominant cause of both small-cell lung cancer and non-small-cell lung cancer is tobacco smoking. However, small-cell lung cancer is more strongly linked to smoking than non-small cell lung cancer. Even secondhand tobacco smoke is a risk factor for lung cancer. Those living with a smoker have an almost 30% increase in the risk of developing lung cancer compared to people who are not exposed to secondhand smoke. Persons with small-cell lung cancer typically have had symptoms for a relatively short time (8 to 12 weeks) before they visit their doctor. Spread to the brain can cause headache, blurring of vision, nausea, vomiting, weakness of any limb, mental changes, and seizures. Spread to the spinal cord can cause paralysis and loss of bowel or bladder function. Spread to the liver can cause pain in the right upper part of the abdomen. Nonspecific symptoms include fatigue, loss of appetite, and weight gain or loss. CT scan of the chest: An X-ray machine linked to a computer takes a series of detailed pictures of the inside of the chest from different angles. Other names of this procedure are computed tomography, computerized tomography, or computerized axial tomography. Bronchoscopy: This is a procedure used to look inside the trachea (windpipe) and large airways in the lung for abnormal areas. 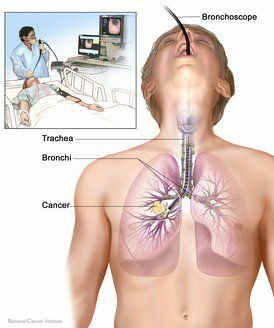 A bronchoscope (a thin, flexible, lighted tube with a tiny camera on the end) is inserted through the mouth or nose and down the windpipe. From there, it can be inserted into the airways (bronchi) of the lungs. During bronchoscopy, the doctor looks for tumors and takes a biopsy (a sample of cells that is removed for examination under a microscope) from the airways. Blood tests: Complete blood count -- CBC -- provides information about the type and count of different types of blood cells, serum electrolytes, kidney function, and liver function. In some cases, these tests may identify the site of metastasis. These tests are also important to assess the organ functions before starting treatment. PET scan: A small amount of radioactive material is injected into the bloodstream and measures the metabolism of the organs to see if the cancer has spread. 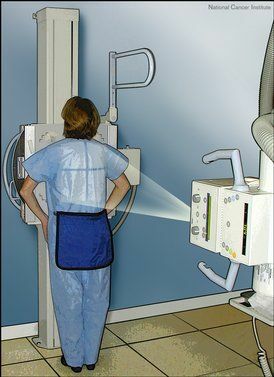 Video-assisted thoracoscopy (VATS): A doctor will insert a lighted tube with a video camera through small openings in the chest. It’s a way to look at the lungs and other tissue. A biopsy may also be done. Endobronchial ultrasound (EBUS): A doctor inserts a flexible tube with a video camera and an ultrasound attached, through your mouth and into your windpipe and lungs. They can look at the lungs and lymph nodes nearby and can take a biopsy of the tissue. Some of the most commonly used medications for the treatment of persons with small-cell lung cancer are cisplatin, etoposide, vincristine, doxorubicin, irinotecan, topotecan, paclitaxel, docetaxel and cyclophosphamide. Standard treatment of small-cell lung cancer involves combination chemotherapy with a cisplatin-containing regimen. Treatment cycles are typically repeated every three weeks. People receive treatment for four to six cycles. Radiotherapy to the chest may be started as early as possible, or it may be given later in the course of treatment. This depends on factors such as the stage of the cancer and the person’s overall health. Radiation and chemotherapy: Sequential-radiation treatment may be given, followed by chemotherapy. However, in comparative studies, the earlier the radiation is started concurrently with chemotherapy (as early as the first cycle of chemotherapy), the better the outcome. If the patient has limited disease, and has had a very good response to chemotherapy, radiation therapy may be given to the patient’s brain to reduce the risk of small-cell lung cancer spreading to the brain. This is called prophylactic cranial irradiation (PCI). It is usually given after the patient has completed the full chemotherapy, and radiotherapy (to the thorax). The radiation doses are low, and the treatment duration is short, so the side effects of this therapy are minimal. Persons with extensive-stage small-cell lung cancer are treated with combination chemotherapy. Currently, the combination of cisplatin or carboplatin and etoposide (PE) is the most widely used regimen. If the disease does not respond to treatment or progresses after initial treatment (called "refractory disease") additional treatment may help relieve symptoms and increase survival time somewhat. The most common drug used in this setting is topotecan. Persons whose cancer does not progress for more than three months may be given additional chemotherapy, including re-treatment with their original chemotherapy regimen. Other drugs may be given to prevent and treat adverse effects of radiation, chemotherapy, or the cancer itself, such as nausea or vomiting. Pain medications are also important to relieve any pain due to cancer or its treatment. Surgery plays little, if any, role in the management of small-cell lung cancer, because almost all cancers have spread by the time they are discovered. A blood work-up, including CBC (complete blood count), is needed prior to each cycle of chemotherapy to ensure that the bone marrow has recovered before the next dose of chemotherapy is given. Kidney function is monitored, especially if the patient is taking cisplatin, as it can damage the kidneys. Also, carboplatin's dosage is based upon kidney function. Other tests are performed to monitor liver function and electrolytes -- especially sodium and magnesium levels -- due to the effects of the cancer and its treatment. Palliative care not only focuses on comfort but also addresses the concerns of the patient’s family and loved ones. Caregivers may include family and friends in addition to doctors, nurses, and other health care professionals. Palliative and terminal care is often given in a hospital, hospice, or nursing home; however, it can also be provided at home. Unfortunately, in most people with small-cell lung cancer, the disease has already spread to other organs of the body by the time it is diagnosed. That shortens life expectancy. The 5-year survival rate is between 2% and 31%. People with small-cell lung cancer in the advanced stage cannot be cured, but treatments are available to improve the quality of life and treat any symptoms of the cancer or its treatment. Support groups and counseling can help you feel less alone and can improve your ability to deal with the uncertainties and challenges that cancer brings. Cancer support groups provide a forum where patients with cancer, survivors of cancer, or both, can discuss the challenges that accompany the illness, as well as guide you in dealing with your concerns. Support groups provide an opportunity to exchange information about the disease, give and take advice about managing side effects, and share feelings with others who are in a similar situation. Support groups also help your family and friends deal with the stress of cancer. Many organizations offer support groups for people with cancer and their loved ones. You can get information about such groups from your doctor, nurse, or hospital social worker. The Lung Cancer Alliance operates a national "phone buddies" program, in addition to other services. American College of Chest Physicians. University of Pittsburgh Medical Center.